I quickly needed an audio book. I found one. I logged onto my local library’s catalog and searched through the audio books I could borrow via download. I came across one with dragons. Since I am writing a story that has a dragon, my interest was piqued. After a little research, I decided to try the book. I am glad I did. 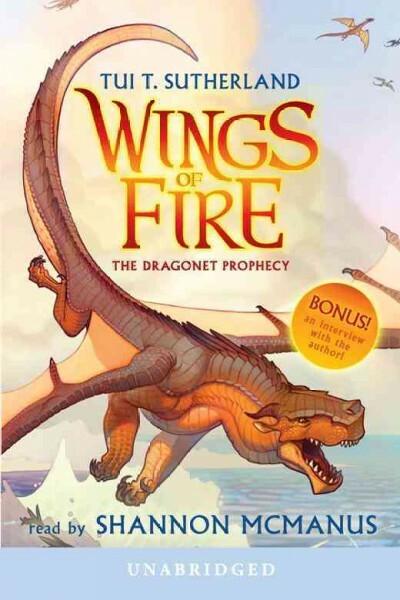 The book is The Dragonet Prophecy (Wings of Fire, Book #1) by Tui T. Sutherland, read by Shannon McManus, who reads wonderfully. This is a middle-grade book. So far, there are seven books in the series with three more yet to come. The publisher’s web site describes the book as: The dragon tribes have been at war for generations, locked in an endless battle over an ancient, lost treasure. A secret movement called the Talons of Peace is determined to bring an end to the fighting, with the help of a prophecy, a foretelling that calls for great sacrifice. I do not often re-read books because, while I like some books enough to read them again, my to-read list is long. Re-reading a book means not reading a new book on that list. However, The Dragonet Prophecy urges me to re-read it more than any other book I have ever read. This urge was triggered by the big reveal near the end regarding the protagonist. After learning the truth and gaining an understanding, I must read the book again with that knowledge so I can see the story from a new perspective.